I’ve never been afraid of the fallout for my personal views and both agreed as well as shared positions -to an extent… not in all points- with the late Pete Seeger. Here are three lyrics I wrote last year that lean to the school of Pete, Guthrie, Dylan and Bruce Cockburn in terms of activist concerns. Not yet recorded but shall be. Not standard blues as I mostly write these days… but blues just the same. I don’t expect tacit agreement. I am indeed happy to agitate where such salt might prove a help to those in need. My Friend Janet Cameron (Rez, Cornerstone Mag, More) Art Exhibition! Tom and Janet Cameron have been friends and co-workers of ours for many decades. Tom first played blues harp in Rez Band, then became exec. producer of all but one Rez record as well as producing all of my solo projects. His sweet wife Janet’s brilliant artwork graced most every Rez album cover, several of my solo projects and did the same for many other Grrr Records artists, etc., as well as others’ records, cds and such. Over its long existence, Cornerstone Magazine’s covers and much inside artwork was hers. 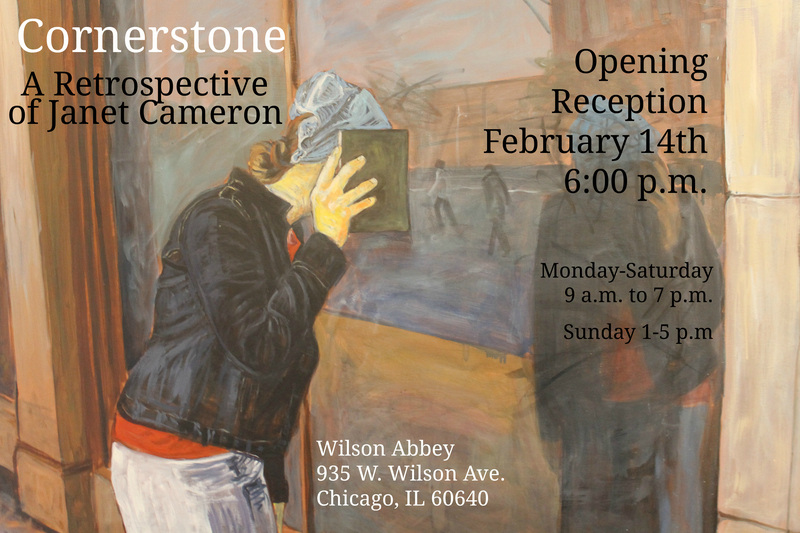 Our newly opened Wilson Abbey (Chicago) and Everybody’s Coffee shop will be doing various concerts, workshops and more- including art shows. We wish to honor Janet and showcase her brilliant work! If you’re anywhere near Chicago during the dates listed you won’t want to miss this! I haven’t taken the time to look through my own blogs to see if I’d written about this phrase before, but it’s a fave of mine. The fact is that some days it truly feels like- and other days it indeed IS an uphill climb to progress in personal character. Though I’m posting this in mid-winter during the polar vortex (! ), this past autumn in our sweet side-yard garden a morning-glory bloomed and climbed right up the wall in great beauty. I mean it was glorious! Now to be clear, I’m NOT saying “that’s ME” in the least… but as a father and grampy I have often been so amazed and blessed at the growth in my kids and grandkids. The same goes for watching progress among friends who have served together in ministry for years here at JPUSA Chicago. It is SOOOOO cool to see forward progress, that upward climb, maybe just a little here and there and in small spurts, but when you are graciously gifted by seeing that happen in a person’s life it truly helps make your own climb a bit easier. I admit, that can be a selfish thing in one sense… but I also know a few folks who beat themselves up over the speed (lack of it) such a process seems to move at. It can feel molasses-like! This is where getting our eyes off of ourselves and also not judging God as some sort of celestial dictator with a bad, spiteful and hateful attitude comes in. He is patient and kind. We are not. He is perfect. We aren’t by a long shot! He is working more of that patience and peace in us and sometimes the best way to find hope is to work with those judged “hopeless”, notice what HE does in their lives and over time realize we’re all a lot alike!! Little by little is how things get done. Humans often want the quick fix, a sort of kindergarten-to-Master’sDegree in a week. Ain’t gonna happen. How often quiet are the small, almost unseen movements of the Holy Spirit working among His people in this moment, that moment, this day and that where we then begin to see- often only in retrospect- growth and maturity taking place. Some sit on a fence and even dig a hole and plant their feet in cement with rebellion. They judge their heavenly Father as one who does nothing in them. They may judge His hand on their life as interference to their own interference regarding spiritual growth! Some live in deep sorrow, rue the day they were born and consider themselves impossible disciples only fit for hell. God is not God enough to produce the fruit of the Spirit in them, so they figure. Both, in my view and experience, are plain wrong. Little by little… whether you realize it or not. The seed planted is going to grow. Keep watering and tending. Let the sun and rich soil do it’s work. Daily Bible study, prayer, confession of sin, praise, thanks, worship, intentionally linking with godly (imperfect but genuine) disciples of Jesus, this is rich soil indeed. Learning to reach out to others and get your eyes off yourself is certainly part of it. All these are elements of the ground of spiritual growth. Don’t forget: we are not alone in this garden. How To Discourage Artists in The Church? Just read a wonderful article online sent to several folks including myself, by a longtime friend, musician and artist Ralson Bowles. In it, author Philip G. Ryken makes a core statement and asks a question I’d like to try at least in small part, to answer. He goes on to give answer by way of his aptly-titled piece, and there are truths here worth living out. A very worthwhile read. My thoughts on this short snippet quoted above? Artists, pastors and churches in general need to both face and reflect the lament factor written all through the Book of God as well as human history. I couldn’t agree more, but think we need to go deeper on this brilliant point. So how do we encourage artists to live out their dual call? What strikes me as obvious is that -all- Christ followers need to be biblical (see John chapter 15) disciples, not merely converts. There are plenty and obvious ways to help people who are open, to healthy spiritual growth. And yet it must be voluntary on the part of each artist. Secondly, our call to create and share our creative offerings must include… wait for it… lament, not only nor purely, light. Both artist and Christian community must quit expecting, even demanding the bulk of artistic offerings (regardless of art form) to -only- reflect the “grace, beauty and truth” of the gospel. You read that correctly. And I happen to be an evangelist. Paul tells us genuine followers of Jesus are “the scent of death” to those who do not believe and are perishing. He writes “the gospel is an offense”, which it certainly is to many if not most in society. Christians as well as non can fall into a very human tendency to deify ourselves. We are not God but truly wish we were! And believers sin. Sin is not limited to pagans! Jesus not only demonstrated His love, He also said “weird stuff” that pulls our nose hairs, sayings like “The one who does not gather with me scatters” and “If anyone would follow me he or she must deny self, pick up their cross and follow me”. “If they loved me they will love you also. If they hated me and my message they will hate yours also”. I am not a morose person, but we need to “weep with those who weep”, not -only- “rejoice with those who rejoice”. Why is it the Book of Psalms is most populated with “laments”?! How is it that we only sense the immediate truth of the Good News when our own sense of being kissed with grace and beauty are involved… but rarely when pain, suffering and rejection surface in our life? Am I the only one who struggles with such matters? God IS good, and the gospel IS true… but does not always feel like it. How would it be blasphemous or always wrong for a Christian artist to also reflect such realities via our art? The whole truth of the good news is that it’s bad news on several very real levels. We can no longer serve another master, including the worst of these… self. There is not only truth but indeed grace and beauty in this “shock of corn that must fall into the ground and die in order for it to bear much fruit”, but let’s not kid ourselves, most art that is widely acceptable to most Christ-followers could not be considered dark. It is THIS side of art (and sometimes artist) that may be as neglected as it is rejected in the churches. As a pastor as well as evangelist and artist I find myself lamenting for so many Christian artists. Their sometimes unwillingness to sit still among church folks is only matched by the unwillingness of church folk to welcome them with all their strangeness and eccentricities. This does nothing to encourage their discipleship nor does it bring vibrant, honest art to the church. “Feel-good” rather than “weeping with those who weep” art may seem to shed the light of Christ, but I would argue Gethsemane, stumbling up the hill under the cross, thorns and blood do also. And of course real-world life goes far beyond strictly “Bible” story representations. Worse than the artist or art being rejected is that those who do not (or at least do not yet) walk with the risen Savior see us as some in the U.K. say derisively, “the happy clappies”. They see our art and decide we apparently don’t suffer as they do. Or worse, that we live a pretend life on this planet. Perhaps Jesus suffered, but not us -not by the art we allow. Yet everyone knows all is not “sweetness and light”. I do think too many Christians (artists, pastors, believers in the churches) expect and demand “the bright side” while it rings hollow in light of the writings of Scripture from the rebellion in the Garden, Cain and Abel, Saul, the very end of the Book of Jonah right down to several accounts in the Book of Acts, Paul’s letters, the Book of Revelation and even in little letters like Jude. IS there GOOD NEWS in the Good News? Absolutely! Ought we to be bringing uplifting works of beauty, grace and light into the sanctuary and other Christian and outreach events? YES! But when our art only reveals light we are only giving half the message. Good News with no contrast, no everyday reality in this broken, fallen world and indeed among imperfect, sometimes sinning saints. This is less than truthful and less than beautiful. I do not mean to say every artistic offering must focus on pain, I am simply saying too many wish our life on earth to literally reflect what it shall be in heaven. We live in the “soon but not yet”! Walking, crawling or stumbling, let’s keep seeking Him and reflecting Him and His values… along with stories that at times, like those in the Bible, don’t end well. Such may ignite the beginning of an earned credibility many outside the Christian faith have yet to give us. To me, the depth of the beauty of Jesus is in His absolute honesty. Truth encompasses beauty but also plenty of other things we often wish to toss out of mind and out of our artistry. Last point: consider the vastness of light and darkness in the Bible stories of both Testaments! The writers were in fact artists. What does God’s own Word allow and therefore teach us? I would encourage balance in both artists and the church in general or I suspect the good news we offer may in reality be less than beautiful, gracious and true by God’s own artistic standard. Wow. Just wow! The webcast last night (1-23-14) was amazing, really almost overwhelming to me in a good way. I’m so aware of my flaws that it’s pretty humbling to hear how what we’ve done has been encouraging to so many. Really good questions from Shawn and Greg as well as those who logged on. A friend who was down in Mexico emailed me this a.m. encouraging me on the show as well. Anyhow, it’s archived and will be available for folks to watch again as they wish. Look for SAGAH BROTHERS in Facebook which will take you to the Spreecast site. So glad we can be at this year’s AudioFeed Festival again as well- these guys are core in putting that fest on. Now off to the burbs to get Wendi some good yarn via a Craigslist friend. HA, a rockstar’s life? Not even close… thankfully! One of the truly tripped-out things I make when building a guitar is a little thing called a canjo (sometimes spelled “canjoe”). So far, mine are all 1, 2 or 3 string instruments meant to play with some sort of slide, that is, a piece of copper pipe, glass pill bottle, 1/4 inch copper T connector or whatever. 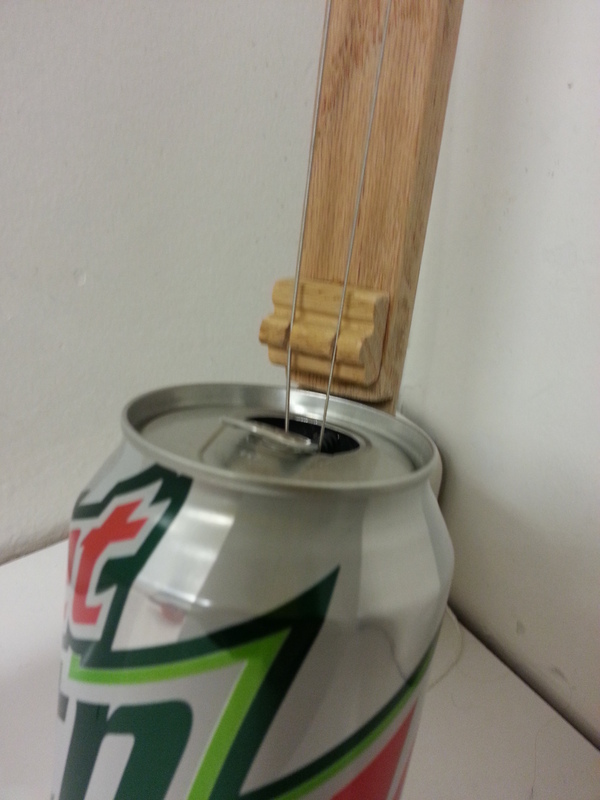 I will being working with frets or at least paper-clip frets (!) soon. A longtime friend named Ron asked for me to make him one and in that it only takes an hour or 90 mins. and is pretty basic, I did. I’ve 4 friends waiting for cigarbox guitars from me… sorry guys but my schedule has been crazy recently. I’ll get ’em done soon as I’m able. Ron lives right across the street, I had to get this one out fast… and still between one of my grandson’s hospital visits (home and doing well now!) and etc., my friend still had to wait several days. Anyhow here are pics as I was able to finish and get it to him tonight. It’s a little 2 stringer, gave him a copper slide and a pic with it, looks cool and sounds great. No pickup but not all that hard to put one on these. 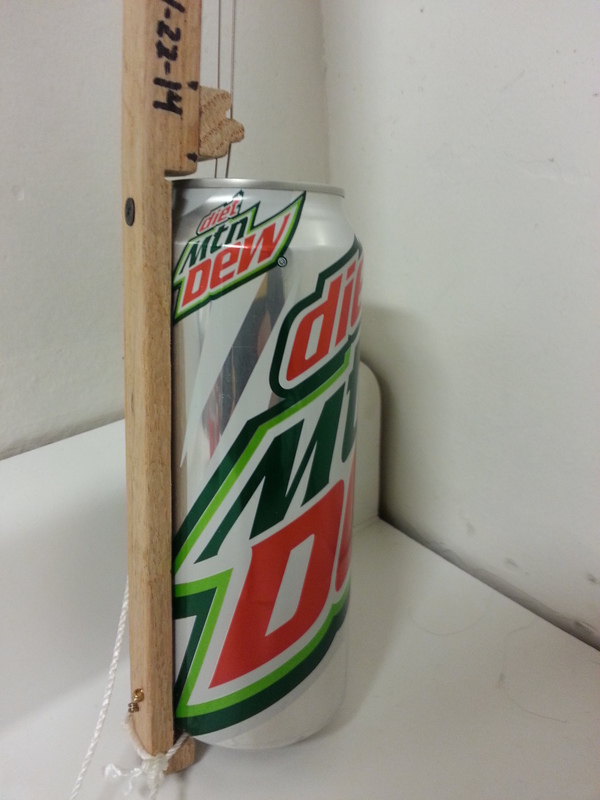 Two wood screws near the top and bottom of the can hold it to the oak neck, both strings help as well. The oak bridge is epoxyed in place. 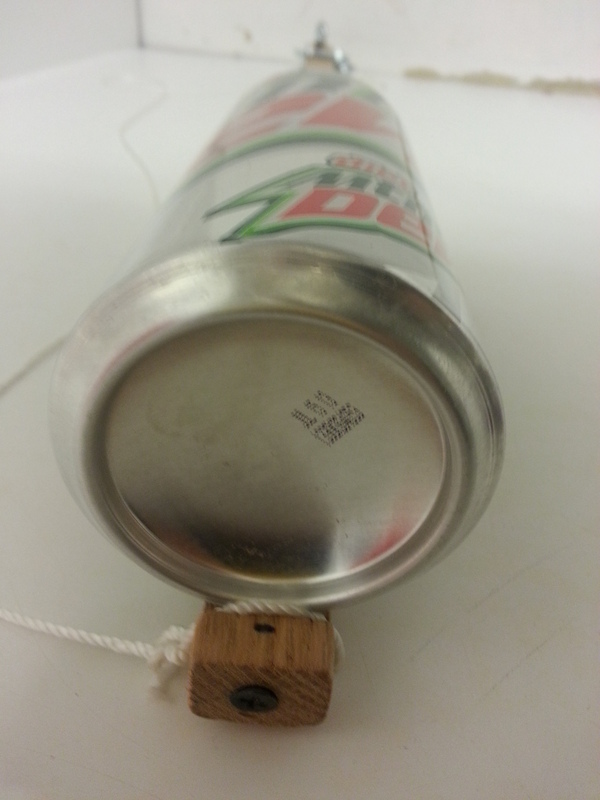 The strings are .036 and .026. Didn’t check the tuning but I normally (as this time) tune them to what would be (think “doe ray me”…) “DOE” for the low string and “SO” for the higher one. 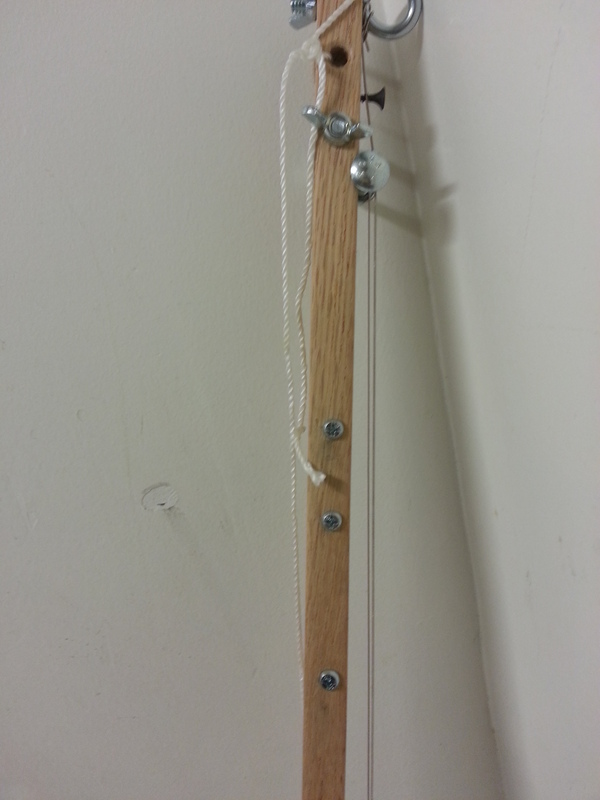 Simple 2 string chord really. Amazing what you can do with very little! Spammers, flamers… don’t bother 🙂 All others, let’s rock.